2 ThE wOrLd OcEaN All the oceans of the world connect and make up one large body of water. This large body of water is called the world ocean. It is thought of as one large biome with many ecosystems and habitats. 3 Oceanic Zone This is the largest zone in the ocean. It occupies 90% of the surface area of the world ocean. It is 200 m along continental slopes to as deep as 11,000 m below the surface. Sunlight does not penetrate very deep into the oceanic zone. 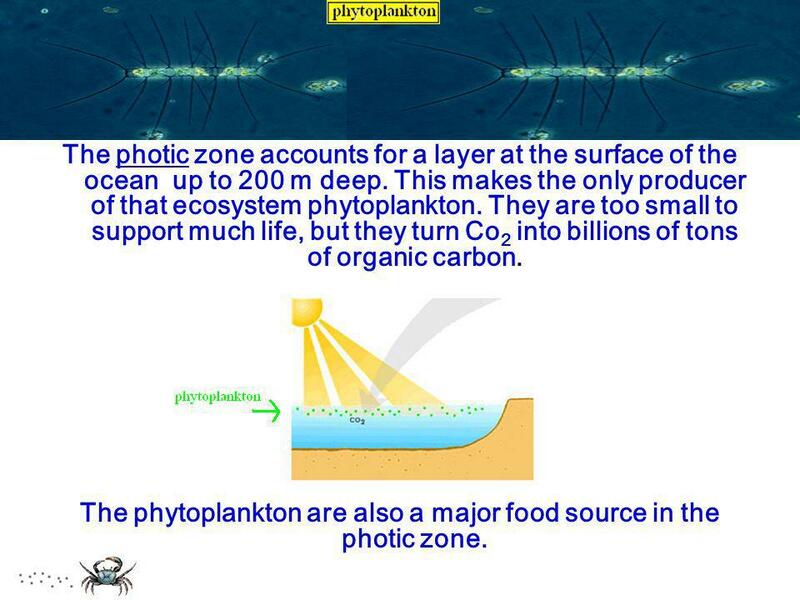 4 The phytoplankton are also a major food source in the photic zone. The photic zone accounts for a layer at the surface of the ocean up to 200 m deep. This makes the only producer of that ecosystem phytoplankton. They are too small to support much life, but they turn Co2 into billions of tons of organic carbon. The phytoplankton are also a major food source in the photic zone. 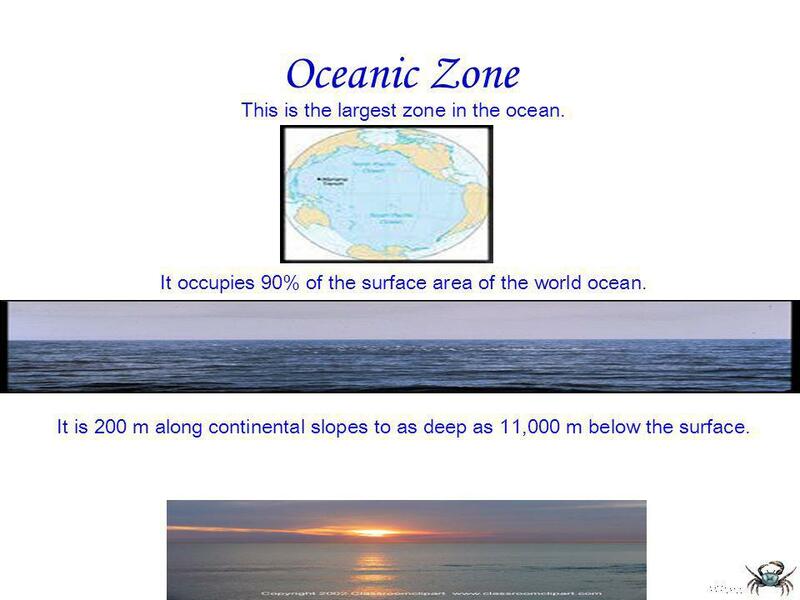 5 The aphotic zone of the ocean can be compared to a desert. Except instead of lacking water, this zone lacks sunlight. This limits the tpe of organisms that can survive there. Many organisms have adapted to the deep, dark, cold waters. Many of these organisms feed and dead material that had fallen from the surface. This material is called detritus. Most of these organisms are worms, clams, and sponges . 6 All the oceans of the world are connected; however, they are not all the same. 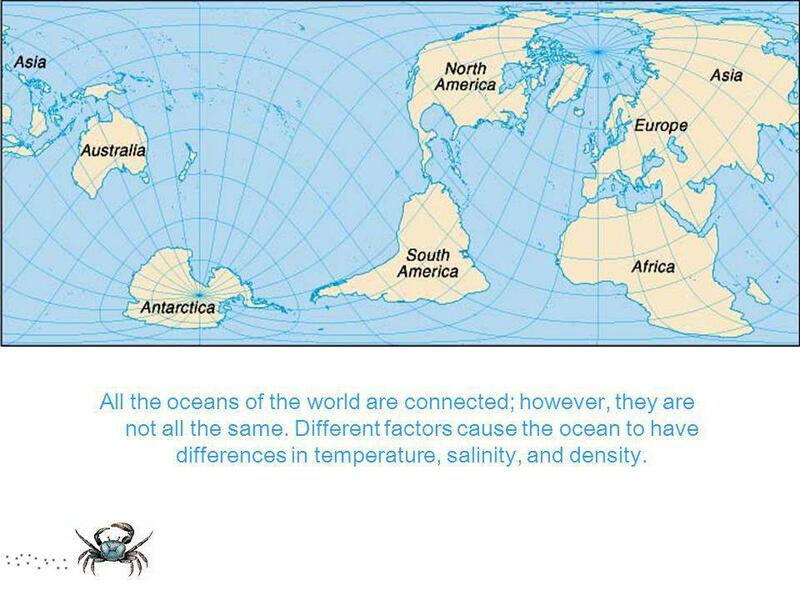 Different factors cause the ocean to have differences in temperature, salinity, and density. shallow bored that surrounds the continent is called the continental shelf. The ocean region between the edge of the continental shelf and the low tidemark is called the neritic zone. The neritic zone lies within the photic zone, therefore it has ample sunlight. This zone is the most productive part of the ocean. The most productive parts are the reefs and estuaries. 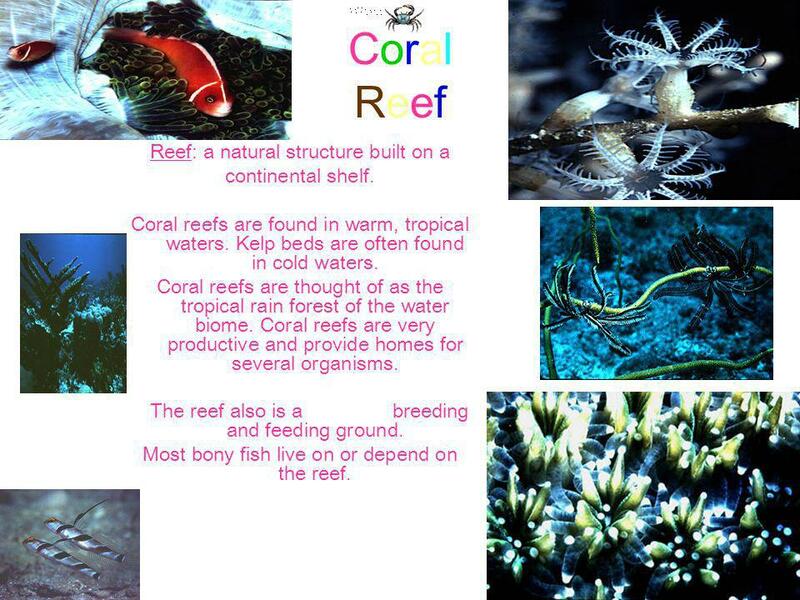 8 Coral Reef Reef: a natural structure built on a continental shelf. Coral reefs are found in warm, tropical waters. Kelp beds are often found in cold waters. Coral reefs are thought of as the tropical rain forest of the water biome. Coral reefs are very productive and provide homes for several organisms. The reef also is a breeding and feeding ground. Most bony fish live on or depend on the reef. 9 CORAL REEF The ecology of a coral reef is fragile. The reef is made up of calcium carbonate skeletons of millions of tiny corals. Only the top part of the reef is alive. 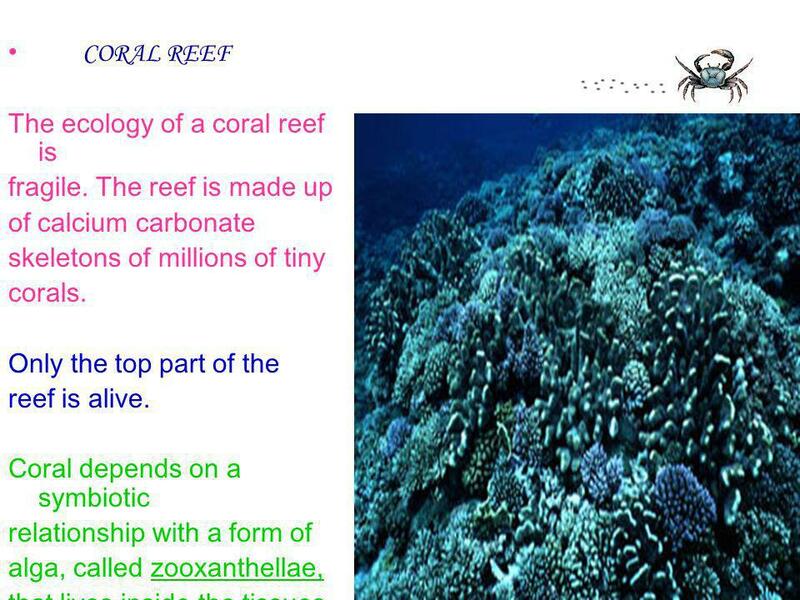 Coral depends on a symbiotic relationship with a form of alga, called zooxanthellae, that lives inside the tissues. source, usually the mouth of a river, meets the salt water ocean. 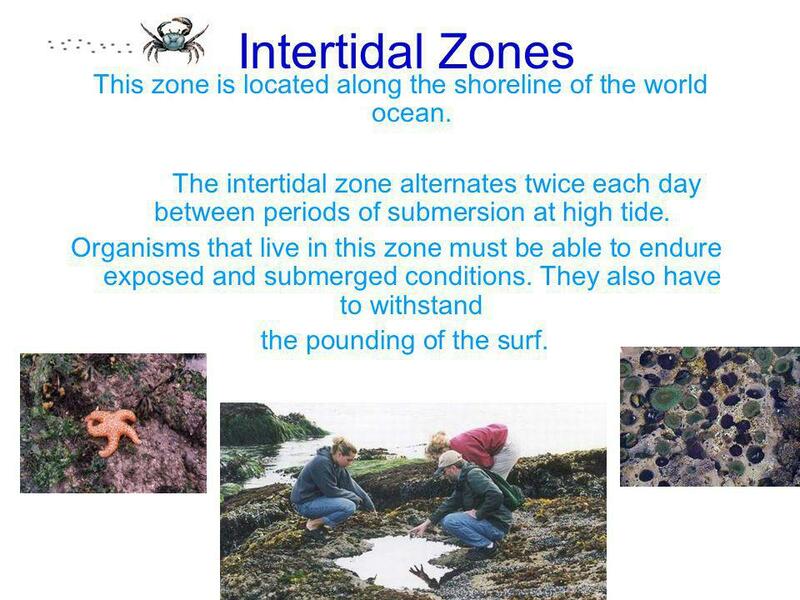 11 Intertidal Zones This zone is located along the shoreline of the world ocean. The intertidal zone alternates twice each day between periods of submersion at high tide. 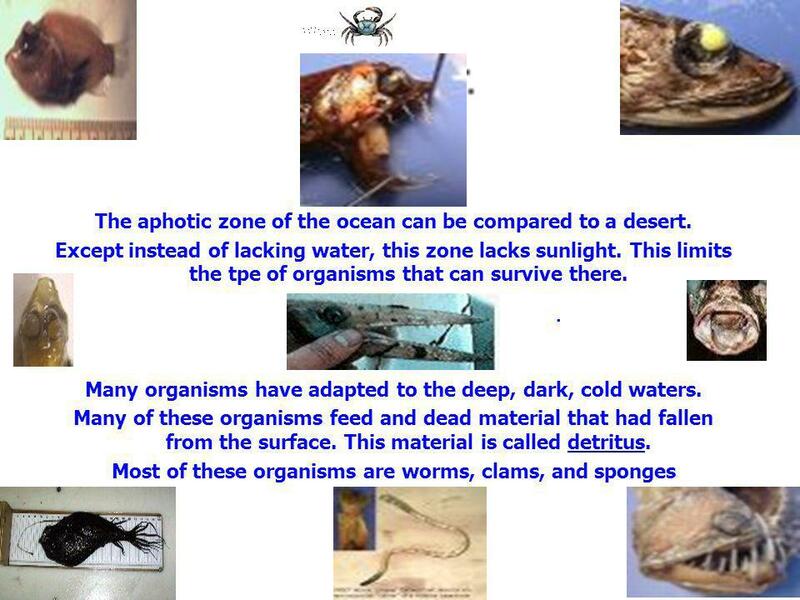 Organisms that live in this zone must be able to endure exposed and submerged conditions. They also have to withstand the pounding of the surf. 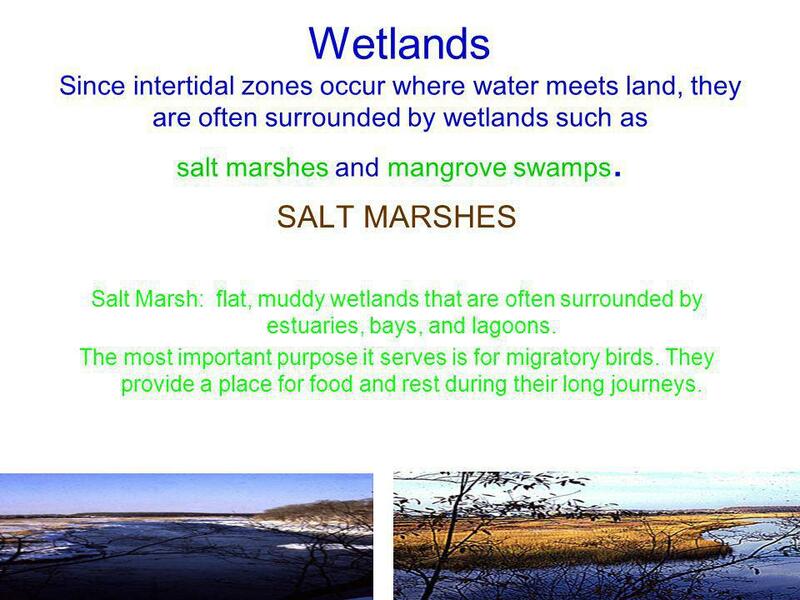 12 Wetlands Since intertidal zones occur where water meets land, they are often surrounded by wetlands such as salt marshes and mangrove swamps. SALT MARSHES Salt Marsh: flat, muddy wetlands that are often surrounded by estuaries, bays, and lagoons. The most important purpose it serves is for migratory birds. They provide a place for food and rest during their long journeys. 13 This causes the course of the river to change sometimes. The Mississippi River undergoes 5,000-year cycle of sediment accumulation , subsidence, and course changes. 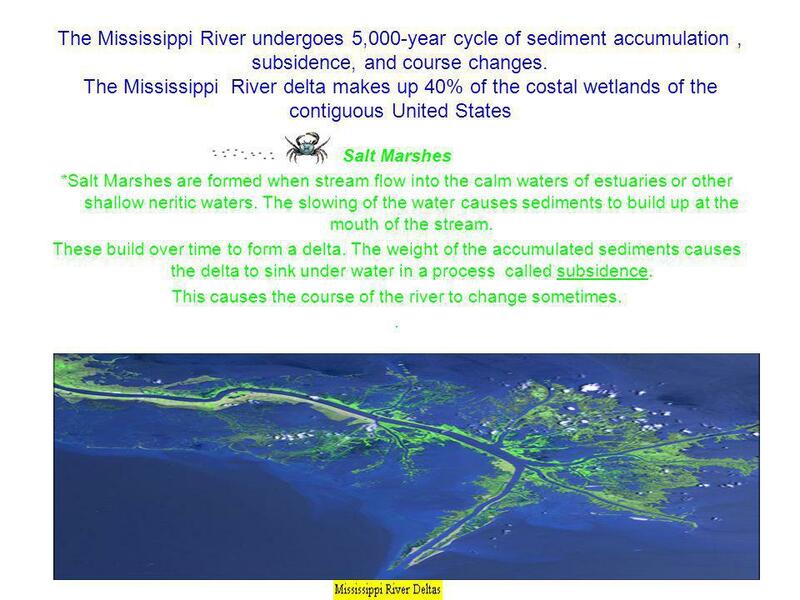 The Mississippi River delta makes up 40% of the costal wetlands of the contiguous United States Salt Marshes *Salt Marshes are formed when stream flow into the calm waters of estuaries or other shallow neritic waters. The slowing of the water causes sediments to build up at the mouth of the stream. These build over time to form a delta. The weight of the accumulated sediments causes the delta to sink under water in a process called subsidence. 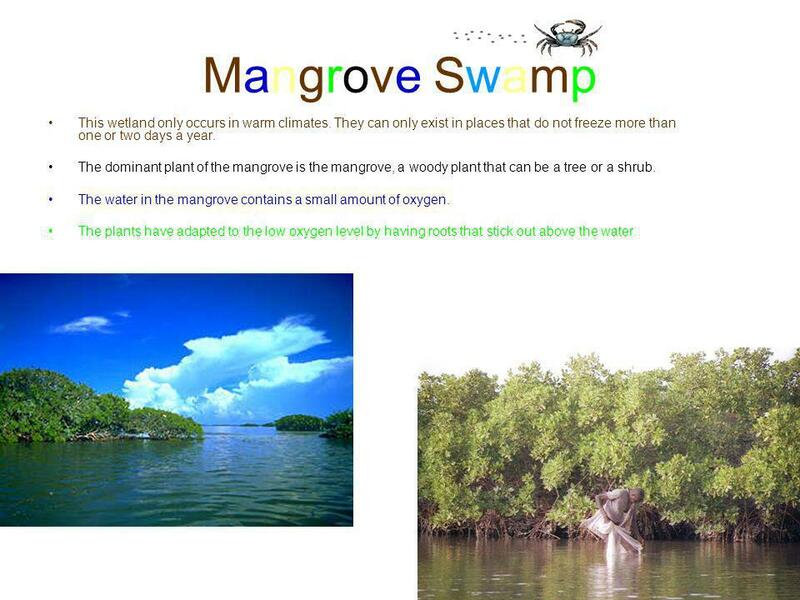 This causes the course of the river to change sometimes. .
14 Mangrove Swamp This wetland only occurs in warm climates. They can only exist in places that do not freeze more than one or two days a year. The dominant plant of the mangrove is the mangrove, a woody plant that can be a tree or a shrub. The water in the mangrove contains a small amount of oxygen. The plants have adapted to the low oxygen level by having roots that stick out above the water. 15 Vocabulary Review. Oceanic – Largest zone of the marine biome. Neritic Zone – Warm waters that account for 10% of the ocean Continental Shelf – Area between the shore and 500m below water’s surface continental. Reef – Natural structure built on a continental shelf. Marshes – Flat, Muddy wetland that surround bays and lagoons Intertidal Zones – Region with daily periods of exposure and submersion Detritus – Tiny pieces pf dead organic material that are food for many aquatic organisms. 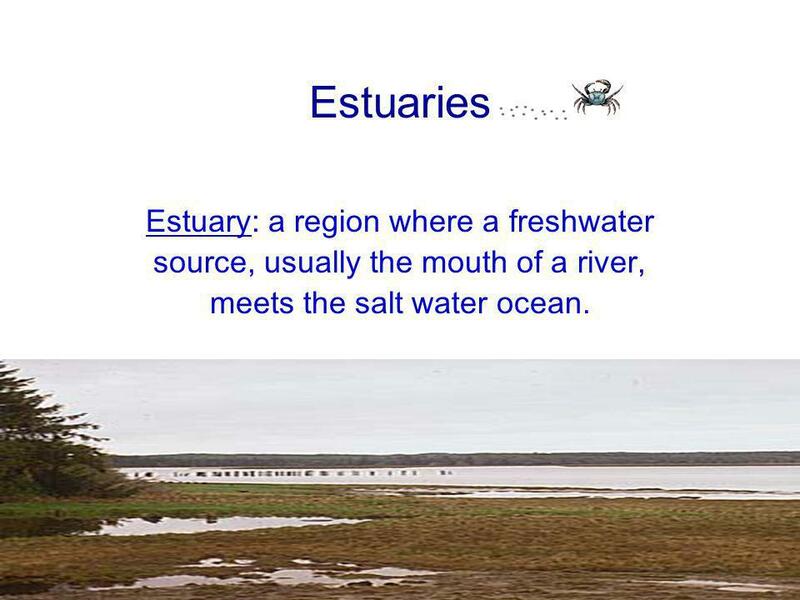 Estuary - A region of water where fresh water meets salt water. 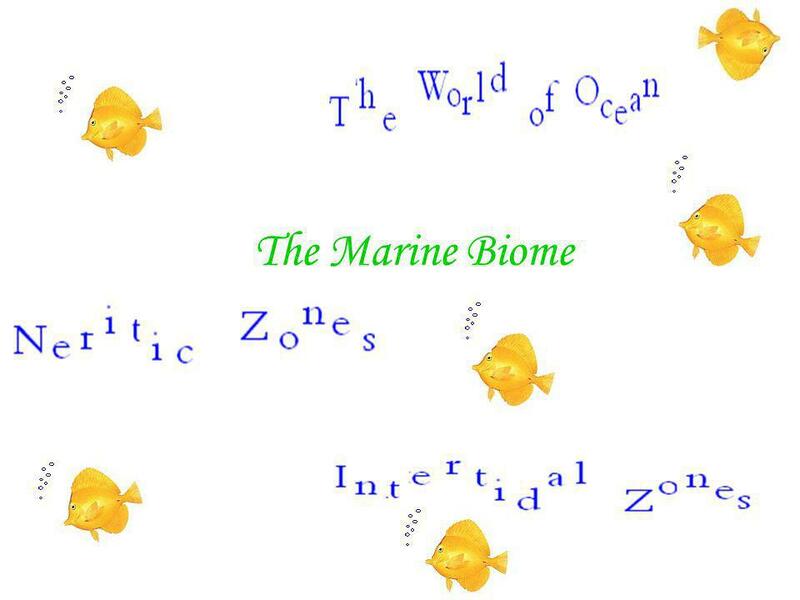 Download ppt "The Marine Biome." Day 3 Topic 2 – Ecosystems. Lesson Overview 4.5 Aquatic Ecosystems. Biomes. The axis of rotation is angled – the latitude that receives the most direct sunlight plus the most hours of sunlight changes throughout. Foothill High School Science Department The Biosphere Aquatic Ecosystems. 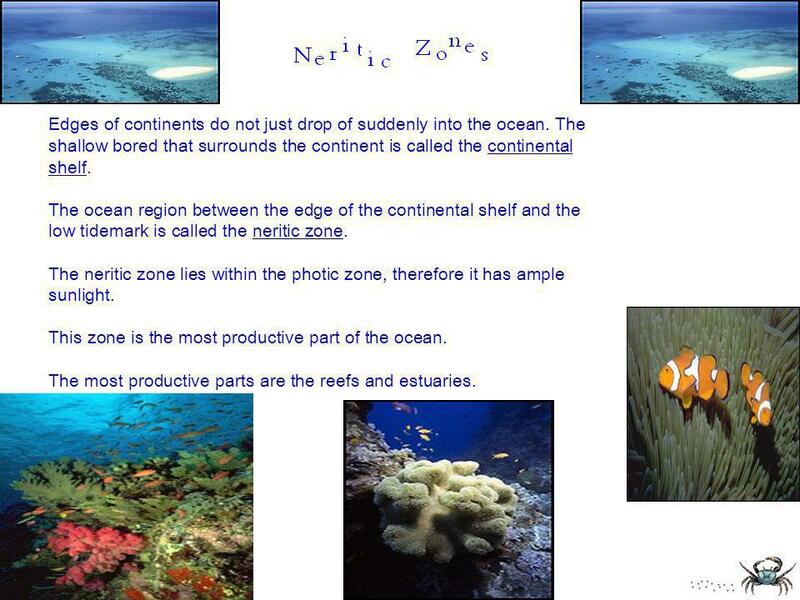 11-2 Neritic Zones Where the edges of the continents meet the oceans. 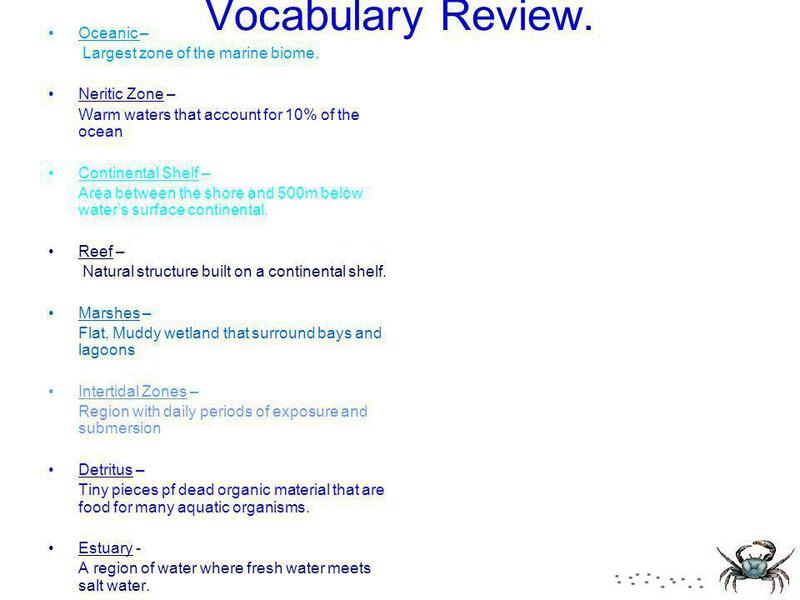 Compare and Contrast What are some ways in which life in an aphotic zone might differ from life in a photic zone Apply Concepts What is a wetland and. What do these abiotic factors have in common? What is different about them? The Marine Biome CHAPTER 11. The Marine Biome Ch. 11. Aquatic Biomes This can be found on my website. What factors influence the kind of life an aquatic biome contains?   Salinity (how much salt)   Depth. 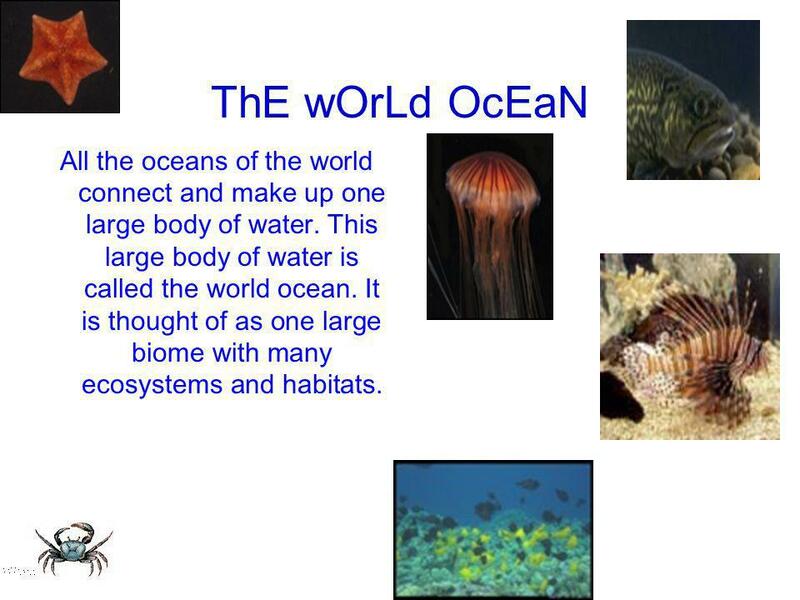  made up of all waters between continents…”The World Ocean”  because waters are interconnected can be thought of as one large biome with many different.